Treating a dry cough with herbal medicine is tricky. As phlegm is the underlying cause of most coughs, one is tempted to dry phlegm to resolve a cough. However, with a dry cough, this further dries out what little phlegm exists. In Chinese Medicine, the lungs are said to be the organ most affected by dryness. For those of us living or working in a dry environment, the lungs are especially susceptible to the dry air we breath. That is why in Colorado and the surrounding areas most coughs end up being dry in a matter of days. 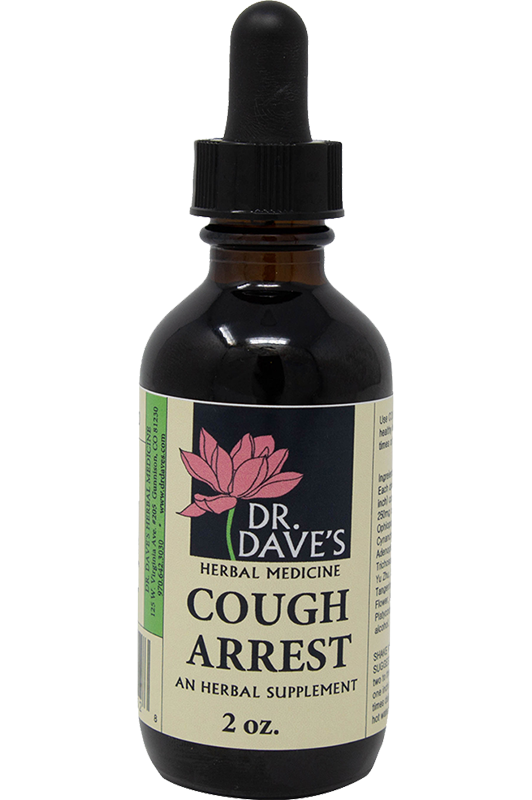 At Dr. Dave's, we emphasize moistening the lungs when treating a cough. This loosens the dried phlegm, making it easier for the body to expel it. Our secondary ingredients gently transform phlegm and increase circulation in the lungs. This way, phlegm is loosened, circulated and expelled, thereby resolving the cough. As it is not prudent to dry phlegm with herbs, it is important to eliminate or cut back on foods which engender phlegm so as to minimize it. Dairy, sweets and greasy, fried foods are the main foods which engender phlegm. When suffering from a cough, even a dry one, it is advised to reduce these foods.